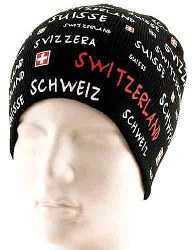 Also see our Baseball Caps for more great Swiss hats! 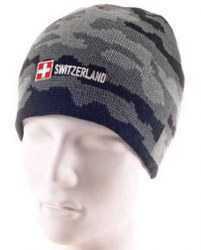 A charcoal colored knit hat. 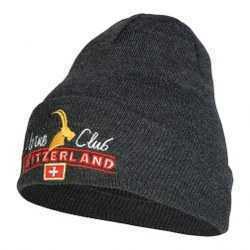 Alpine Club logo and Swiss flag embroidered on front. 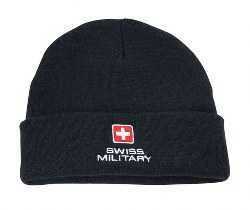 Black knit hat with a Swiss Cross and “Swiss Military” embroidered on front. 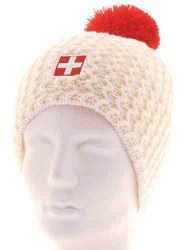 100% acrylic fleece-lined stocking hat with a Swiss Cross on front, Switzerland embroidered on the back, and a red/white snowball on top. 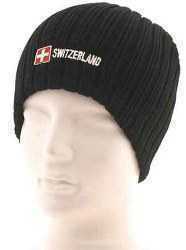 Black Knit Hat - stretchable with “Switzerland, Svizzera, Suisse, Schweiz” and Swiss Flags embroidered on the hat. 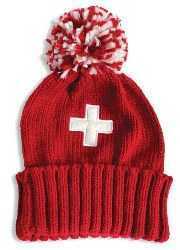 Hat has an embroidered Swiss Flag and "Switzerland", 100% Poly double knit hat, one size fits all. 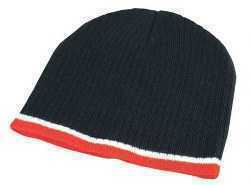 This white stretchable knit hat has a white fleece lining with a red fuzzy snowball on the top. 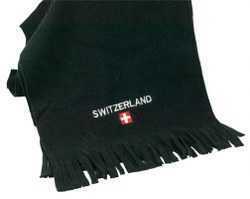 The Swiss flag is embroidered. Fleece for Cooler Weather. Matching to our Black Fleece Hat.